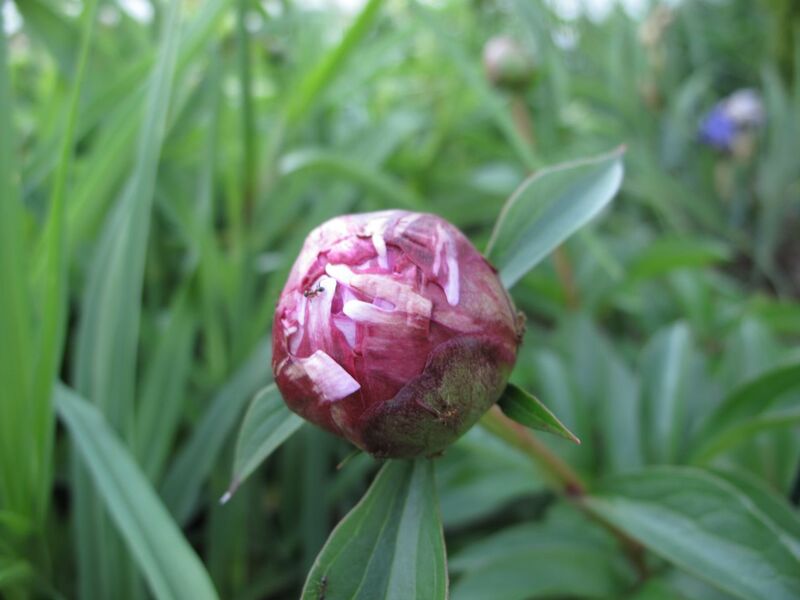 Paeonia ‘Pink Parfait,’ a peony added last spring to the garden, has just two buds this year. 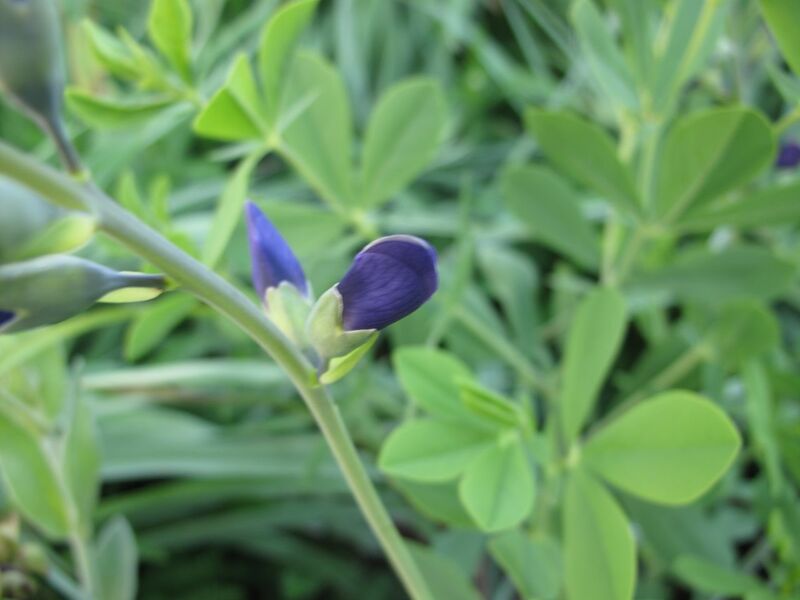 Baptisia ‘Purple Smoke’ is opening in several places around the garden, its color a rich dark indigo. More fully open another Baptisia ‘Purple Smoke’ looks pinkish in the late day sunlight. The actual flower color is more like that of the bud in the previous image, a beautiful deep blue. In the southern garden bed the black iris continues to stand out against silvery Stachys byzantina (Lamb’s Ear). Close up the color of black iris is intense. 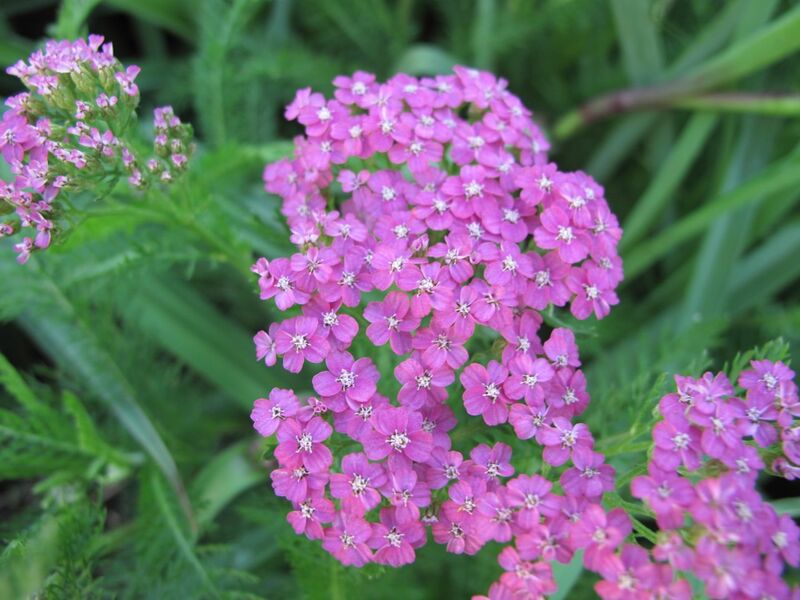 A couple of pink Achillea (yarrow) opened recently. This is a dwarf variety that stands about 10 inches high. 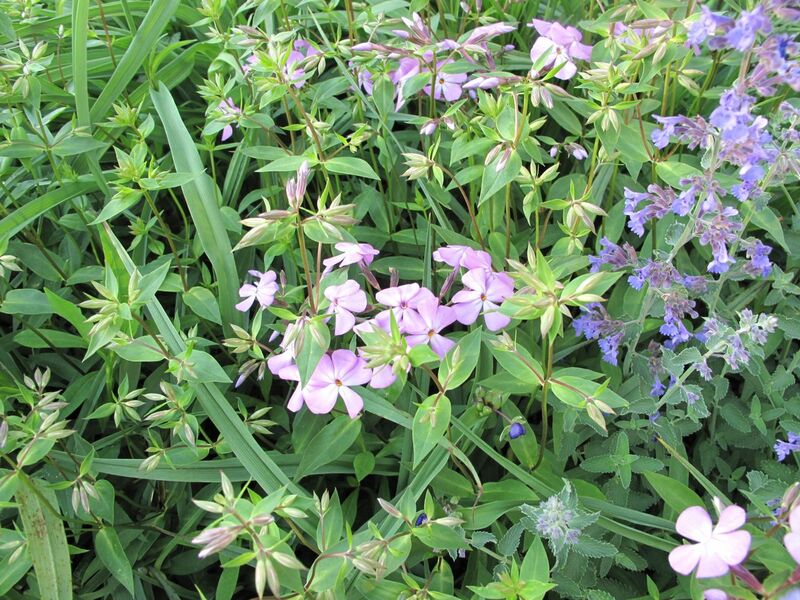 Phlox divaricata (Woodland phlox) and Catmint (Nepeta) are paired together though happenstance but appear to make nice companions. 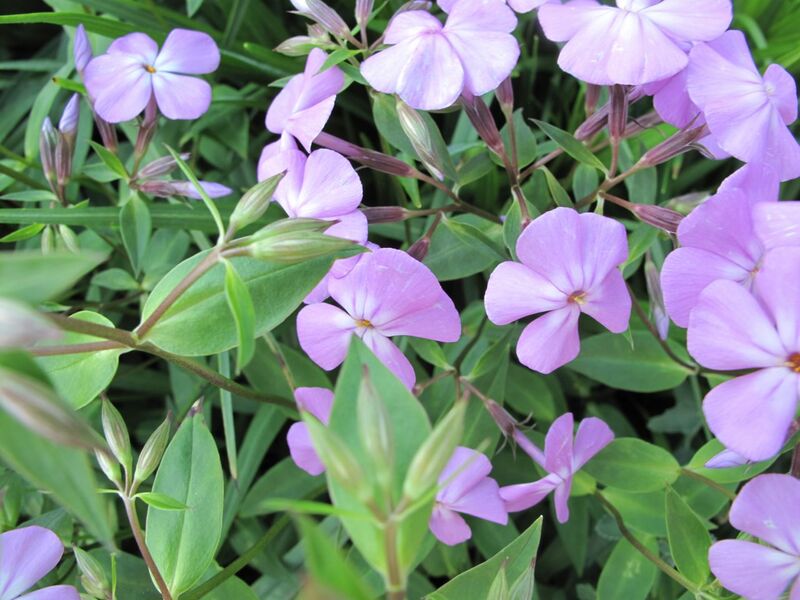 The phlox divaricata is a pass-along plant that has been in this garden and a previous garden forever. It is an old-fashioned, charming favorite. Nepeta (Catmint) makes a nice show a the front of the border. 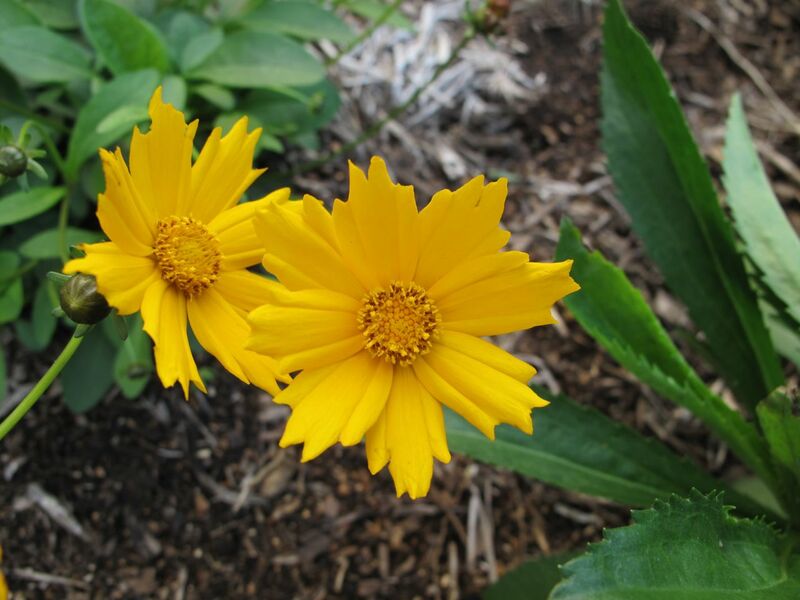 This Coreopsis was added to the garden last year and did very poorly. It is surprisingly healthy this spring with a deep rich golden yellow. Except for one hot and dry week April has brought generous rains to the garden. Following a few threats of frost this past week, temperatures reached into the seventies today. Starting very early today, rain alternated with sun throughout the morning and then the afternoon was fair. All day the birds have sung incessantly. The garden needs attention now, but it is going to be on its own a few more days. 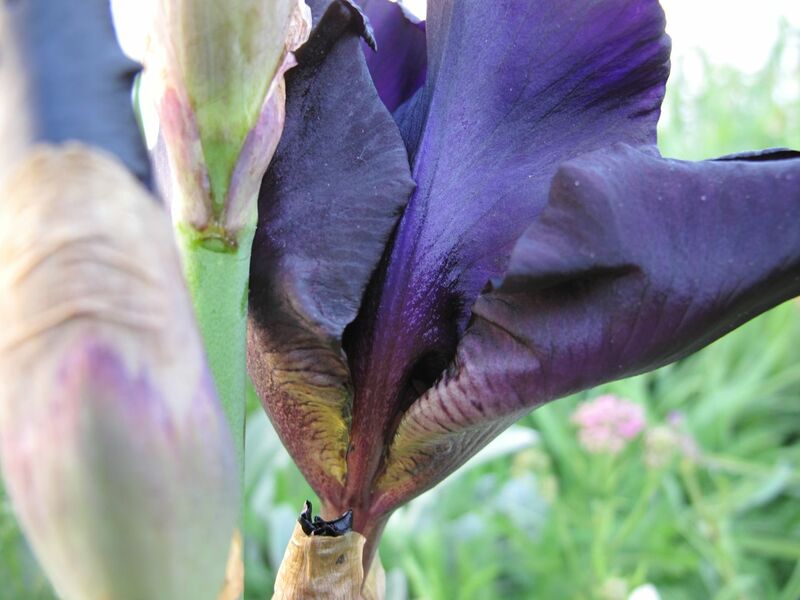 After this recent strong period of bloom, some things such as the roses and a few of the irises need grooming as they are beginning to look a little tired. The tradescantia is encroaching in every direction and the eastern red columbine should be cut back soon before it spreads seeds. In the meditation circle Iberis Sempervirens (Candytuft) is overdue to be pruned back, but the recent cooler weather and rains encouraged it to produce fresh blooms, earning it a few more days. This entry was posted in garden and tagged achillea, almanac, Baptisia 'Purple Smoke', coreopsis, iris, nature photography, nepeta, Paeonia 'Pink Parfait', pass-along plant, perennials, Phlox divaricata, photographing nature, photography on April 26, 2012 by pbmgarden. So much in flower already! Lovely to see what grows in your garden. 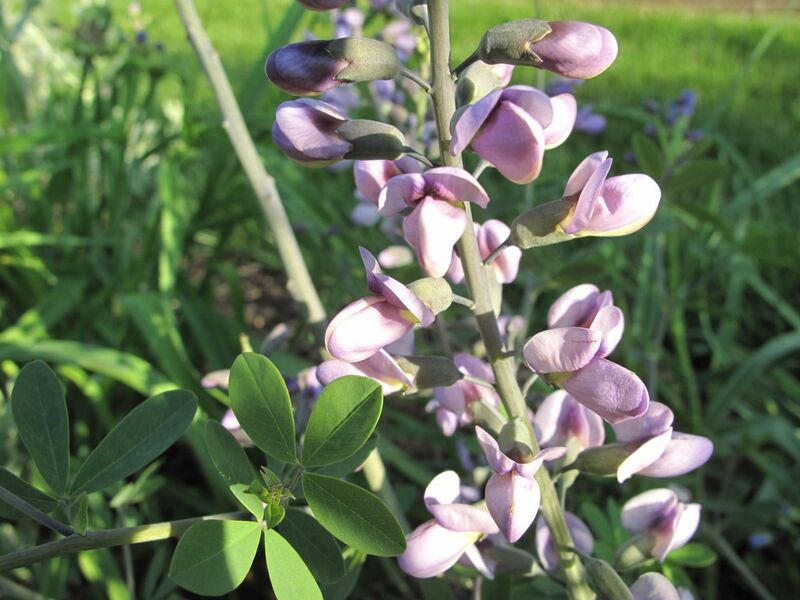 I have a Baptisia still waiting to be planted out… it’s still only about 3 inches high! 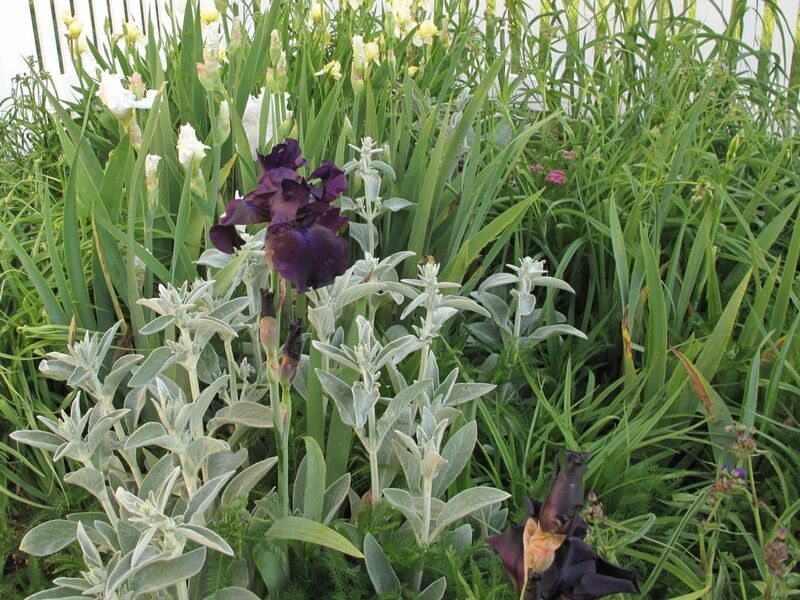 I love the black iris among the stachys – very effective. And a dwarf Achillea sounds like a good idea! Thanks for a lovely post! Thanks Cathy. Good luck with your Baptisia. There is a pale yellow one that I’ve seen a lot recently here and I like it very much, called ‘Carolina Moonlight.” What color is yours? Your coreopsis is such a pure yellow. We planted a couple of dozen in one of the communal gardens at the lotties yeaterday, so really looking forward to flowering later on. A grouping that large should be very nice. The pastel colors are just beautiful, thanks for posting! I like Nepeta too. Last year I moved a few pieces that had broken off into the front of the border and it is doing well there. 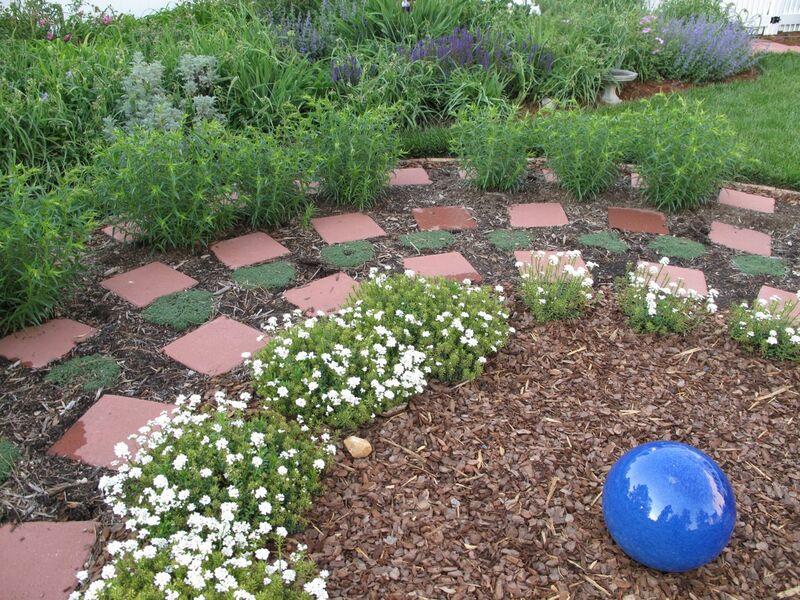 The original plant is buried in the middle by taller plants, where it loses its impact. Most of my garden seems to be in fast-forward mode. 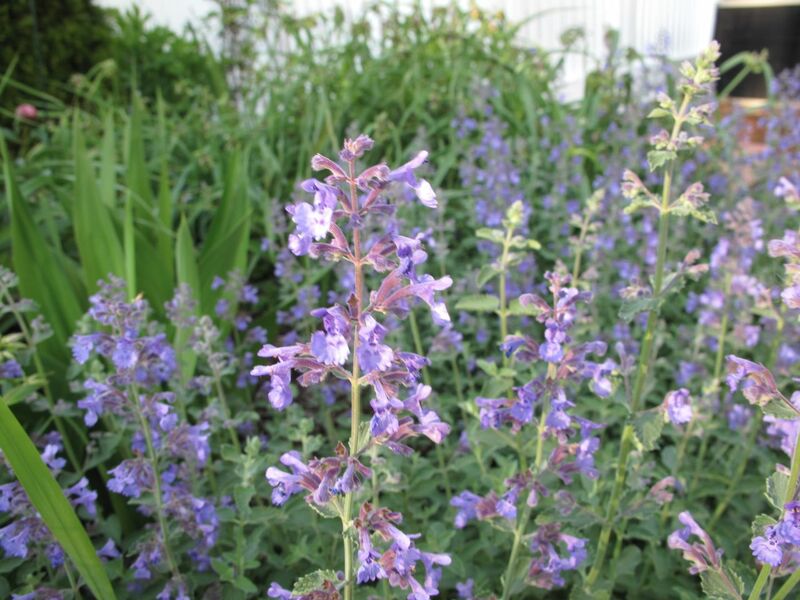 Hope your Nepeta will do well for you this year.